BYD’s California truck and bus facility isn’t much to look at – an elderly concrete tilt-up in a mostly still unbuilt industrial center in Lancaster, a high-desert community about 70 miles north of downtown Los Angeles. But things are changing for the electric vehicle maker, a unit of China’s giant BYD Co.
BYD has started a factory expansion on a 200,000-square-foot lot in front of the former recreational vehicle assembly plant the company acquired in 2013 as part of a deal to sell electric buses in the U.S. Plans call for the workforce, now about 530 people, to triple by 2020, with most of the jobs located at the Lancaster facilities. For now, much of BYD’s growth comes from the electric bus operations. It just inked a deal to supply 20 electric shuttle buses to the University of California, Irvine, and has sold about 300 buses in the U.S. since 2013. But medium- and heavy-duty electric trucks make up an ever-increasing part of BYD’s commercial vehicle business in the U.S., said Andy Swanton, vice president of the BYD Truck division. In the U.S., the truck and BYD Coach and Bus operations are subsidiaries of BYD Motors. In just two years, BYD Truck has sold about 150 electric trucks to U.S. customers, he said. BYD has taken direct aim at the port and rail yard business with a new Class 8 tractor, but its electric truck portfolio is much broader than that. The company presently offers medium-duty step vans, stake-bed, box and refrigerated trucks using BYD’s trucks in the Class 5 through 7 weight segments. It offers a Class 6 trash collection truck and Class 8 tractors designed for the short-haul goods movement industry, principally in ports and other freight-handling facilities. 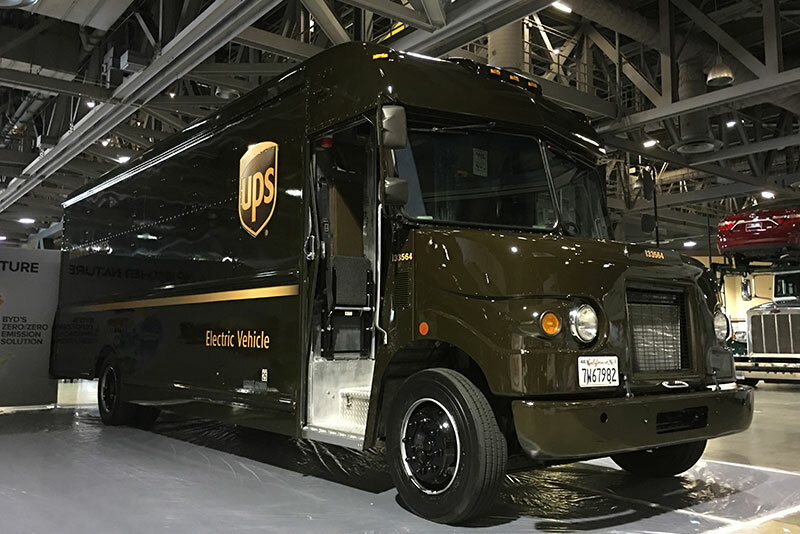 Its step vans have been developed as a pilot project with delivery giant UPS, opening up a significant potential marketplace. The first two of the Class 8 off-road tractors were delivered to the Port of Los Angeles late last year under a $26.6-million “green terminal” demonstration project funded by the California Air Resources Board and the terminal operator, Pasha Stevedoring and Terminals. Additionally, the company is supplying 27 medium- and heavy-duty electric trucks for freight handling and service truck duties at a trio of railway and truck freight yards in inland Southern California under a $9.1-million grant from the state’s air quality regulators. BYD also is developing a heavy-duty trash truck and a Class 8 on-road tractor for the U.S. market, using a model already in service in China, Swanton said. The trucks will use the company’s integrated rear-axle motor with an internal transmission. The over-the-road truck can travel 100 miles on a single charge of its batteries, he said. Down the road, he said, are plans for Class 1 to 4 trucks that can be configured in a variety of ways, from walk-in delivery vans to municipal street sweepers. While buses have been BYD’s best business in the U.S., Swanton said truck sales are starting to catch up. Electric trucks aren’t new – light- and medium-duty models have been in the market for years now, although sales numbers are low. But interest has increased along with increasing restrictions on diesel exhaust. The main barriers, he said, are initial price (electric trucks can cost tens of thousands of dollars more than diesels), skepticism about the reliability of electric truck technology, and uncertainty about the cost and availability of charging systems. 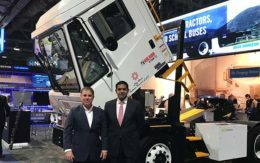 “But when you factor in fuel savings and maintenance savings over the life of a truck, then even when you disregard the state and federal incentives that most electric truck purchasers get, there’s a good business case to be made,” said Swanton. Incentives, he added, simply boost the financial case for going electric. Another barrier is competition. While BYD is a big player with lots of financial backing, it isn’t alone in the electric truck – or bus – markets. BYD’s electric bus division makes everything from small shuttles to this large, 60-foot articulated transit bus. It has orders for the big bus from transit districts in Albuquerque and California’s Antelope Valley. 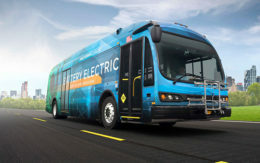 In addition to Proterra, other electric bus competition includes Ebus, a California manufacturer; Green Power Motor Co., a Canadian electric bus maker with a U.S. subsidiary in California; and New Flyer Industries, a major conventional bus maker that has branched into electric powertrain offerings as well. New Flyer is headquartered in Winnipeg, Canada, but has extensive U.S. facilities. On the truck side, BYD competes against companies such as Orange EV, a Kansas City-area start-up manufacturing electric trucks including drayage tractors for ports and freight terminals; Nikola Motor Co., a Salt Lake City-based developer of a Class 8 hydrogen fuel-cell electric over-the-road tractor; and Wrightspeed Powertrains and Motiv Power Systems, Northern California manufacturers of commercial vehicle electric powertrains. Motiv makes all-electric systems and Wrightspeed makes electric drive systems with range-extending turbine generators. 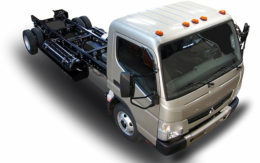 Workhorse Group, an Ohio-based manufacturer of Class 3 to 6 electric trucks and step vans, also competes in some of BYD’s markets. Additionally, several major truck and carmakers have announced plans to enter the electric truck market in coming years. They include Toyota Motor Co., which recently announced its intent to develop a Class 8 fuel-cell electric truck, and Daimler, Mack and Tesla, all with plans for medium and heavy electric trucks. BYD Co., a Chinese company founded in 1995 as a battery maker, is based in Shenzhen, a business and financial center just north of Hong Kong. It acquired a Chinese car company in 2003 and has since become one the world’s largest electric car, bus and truck manufacturers. But while BYD’s corporate officers and directors all are Chinese, more than 60 percent of its Hong Kong-traded stock is owned by U.S. investors. Chief among them is billionaire investor Warren Buffet’s Berkshire Hathaway Corp. It owns 9.9 percent of the company and is BYD’s largest shareholder. The 120,000-square-foot BYD Coach and Bus plant in Lancaster can turn out 150 buses and 100 trucks annually. Bus production could grow to 1,000 units when the plant is fully built out, Swanton said. As orders increase, truck production is expected to swell as well. There’s a 40,000-square-foot extension of the existing facility set to open early this year as well as the 200,000-square-foot expansion that is planned for completion at the end of the year. The company’s battery unit operates a separate lithium-ion battery assembly facility in a 44,000-square-foot facility a few miles from the truck and bus plant. BYD says it’s the only electric vehicle company that makes its own batteries. It uses a lithium-iron phosphate chemistry that provides slightly less energy density per cell but longer life and greater thermal stability than other lithium chemistries. That enables BYD to provide 12-year battery warranties for its buses and trucks. BYD initially intended to compete in the U.S. passenger car market but was stymied by industry and consumer resistance to Chinese-made cars. When BYD first came to the North American International Auto Show in Detroit nine years ago, it was relegated to the basement of the Cobo Hall exhibition center. BYD’s U.S. car models – a hybrid and later an all-electric crossover called e6 – never caught on with consumers. It intends to resurrect its U.S. car business with a new line of BYD electric and plug-in hybrid passenger cars by 2020. After its disappointing debut in the U.S., BYD quickly switched gears and decided to use its bus-making capabilities to help gain a foothold. Executives reasoned that customers for commercial vehicles are driven largely by economics and are far less concerned than car shoppers about brand name and status. BYD’s expectation that its trucks will be highly competitive in a few years is not an unreasonable time frame. Air quality, noise pollution and fuel price volatility concerns have created “global and regional momentum to keep electric momentum going,” said Bill Van Amburg, head of trucking programs for CalStart, the Pasadena-based clean transportation technologies coalition. California is particularly driven to replace diesel trucks with clean-emissions alternative fuel vehicles when possible, he said. The push for these types of emissions-free vehicles comes from local and state regulators’ concern over air pollution on bus routes and around ports, rail yards and other areas where trucks operate. “Electric trucks and buses can eliminate tailpipe pollution while offering reduced maintenance and operating costs,” said Don Anair, research director for the Union of Concerned Scientists’ Clean Vehicles program. Related: Electric Truck and Bus Maker BYD: What’s in a Name? employers truck drivers how long it will take for training for pay rise for driver on the highway everyday shift like tools an boxes an food . I drove that UPS package car that they converted. It was just awful. Broke down many times. Had no power at all. Engineers didn’t listen to what we were wanting and looking for. I understand the concept and the first time around there are bugs to work out.